prepared by evaporating milk and reducing it to its solid form. Nowadays people don't have enough time to make this traditional method to make khoya, and at some places it is difficult to get it from grocery stores too, so I have come up with this simple method to prepare mawa at home without compromising the taste and with only 3 simple ingredients which are easily available in your kitchen pantry. 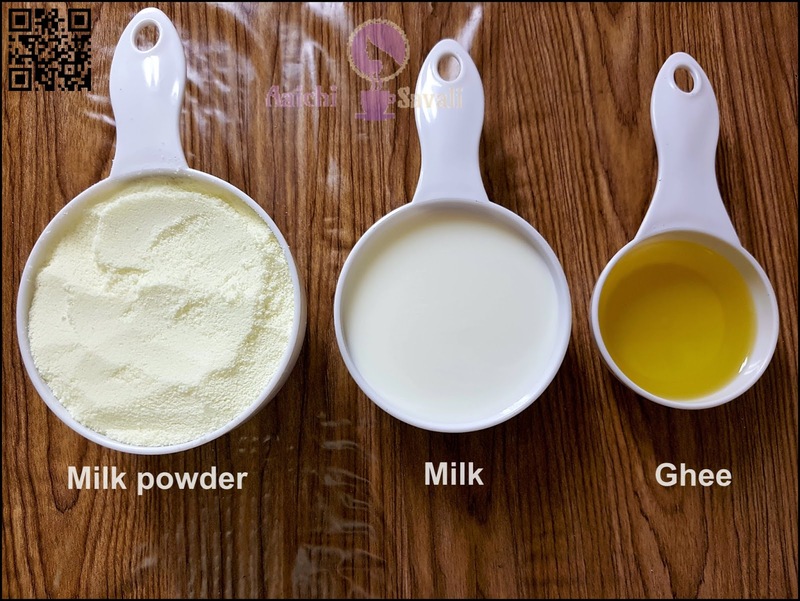 The method shown below is pretty easy to make, and you can have instant khoya ready in minutes. This can be the best khoya recipe. Give it a try! Turn on flame and heat pan over medium flame and add 1/2 cup of milk and 2 tbsp of ghee. Heat the mixture just till it comes to a boil and add milk powder 1 cup to this milk and ghee mixture. Keep the flame low and keep stirring constantly, as they do not form any lumps. Mix and stir on medium flame for 3 minutes. After 3 minutes mava is ready. You can shape it however you like while it is warm. After that you can grate it or crumble it as needed. Here, instant homemade Khoya / mawa is ready. Enjoy!!! 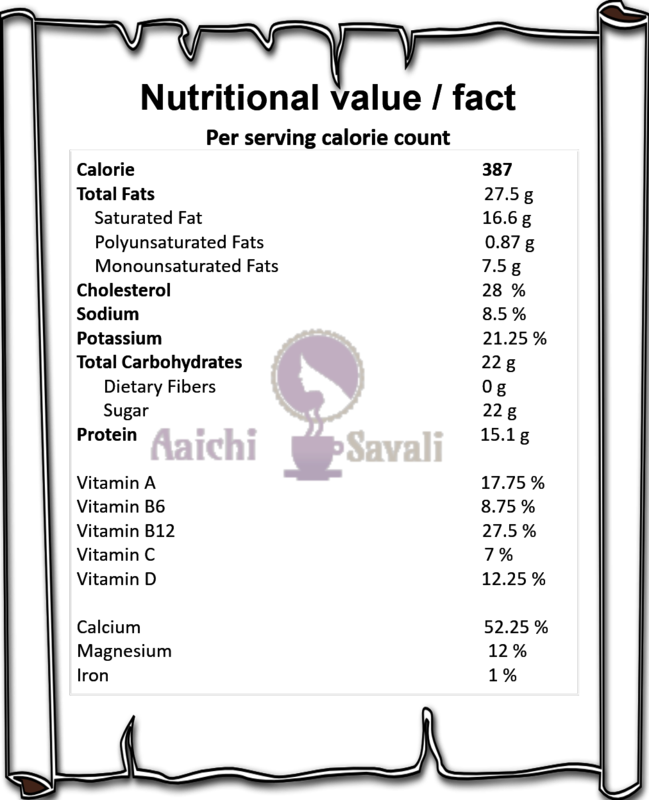 Here are some famous recipes those are usually prepared by using khoya, Khoya Gulab Jamuns, Khoya Kaju Katli, Khoya Modak, Khoya Burfi, Khoya Gajar ka Halwa, Khoya Peda, Coconut Khoya peda, Khoya poli and many more. Per serving contains 387 calories, along with carbohydrates - 22 g, fats - 27.5 g, proteins - 15.1 g.
Khoya or mawa promotes bone health as it has high calcium, protein, reduces blood pressure and promotes eye health. Eat Healthy, Stay Healthy !!! Very useful and nice recipe. Nowadays we get adulterated khoya in the market. 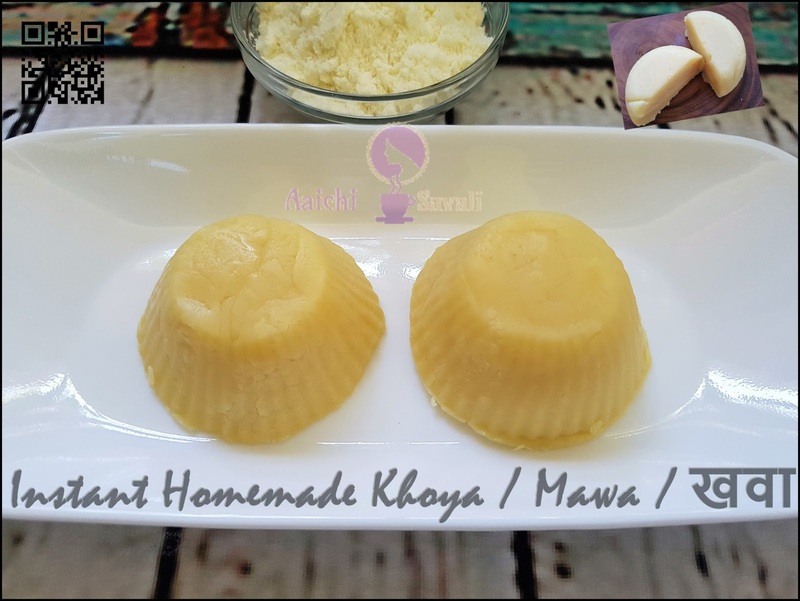 So it ids a good idea to make khoya at home with this easy recipe. Thanks a lot. Yes it is easy and made with easily available ingredients. Nice recipe, one question can I use salt free butter instead of ghee?. Forgot to ask you about how much khoya is made with the recipe in oz?. And can you double or triple the recipe.